← Together, a dwelling place for God. 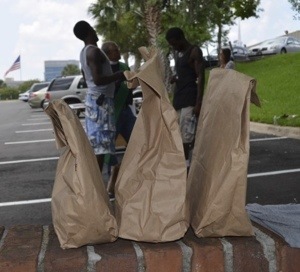 Recently, at one of our post-worship picnics, I enjoyed watching a local church youth group distribute lunches to the congregation. We had been able to have our service outside, under the sycamore tree, but then decided to come inside our bishop’s conference room for lunch. When the rain came down, we were grateful for cover. After everyone had been served, I found a seat in the back, next to a young man, whom I’d met a few weeks earlier at our “mission camp.” We opened our bagged lunches and discussed the pros and cons of mayonnaise. I added a little to my sandwich, while he skipped it altogether. I shared about how my beautiful southern belle of a mama loved mayo. “She would slather anything with it,” I explained. “Like frosting?” He chimed in. “Exactly!” “Yuk!” We agreed that when it comes to mayo there is such a thing as too much. As we dug in to our sandwiches, I asked my young friend if he’d gotten a bottle of water, and he indicated that he had. “I brought a packet of Crystal Light for it,” he confided, “but I don’t think I’ll use it.” I processed this for a second then said, “that’s because you don’t want to make anyone else feel bad or left out.” He shook his head, confirming this. This entry was posted in Christianity, Grace, Uncategorized, unity and tagged church without walls, compassion, holy ground, homelessness, hope, street ministry. Bookmark the permalink. 4 Responses to What matters. Thank you, Beth. This is beautiful…. I remember caring so much about others when I was young. Although I still care, sometimes I forget caring is all that matters. Nothing else is important. I pray that these young people always keep that caring spirit.